More specifically, within the FDA is the Center for Biologics Evaluation and Research (CBER) whose mission it is to use sound science and regulatory expertise to protect and enhance the public health through the regulation of biological and related products including among other things, vaccines. Vaccines are given to about 4 million American infants annually and are not put through the same level of safety testing as new pharmaceuticals. One can argue that vaccines, which are given to healthy patients, should be tested more rigorously than drugs because they are not given to treat an existing disease or condition. Inadequate testing ensures that the true risk/benefit assessments for the safety and cost of vaccines are impossible to calculate accurately, and, therefore, the FDA is failing to protect the public from preventable vaccine injuries. 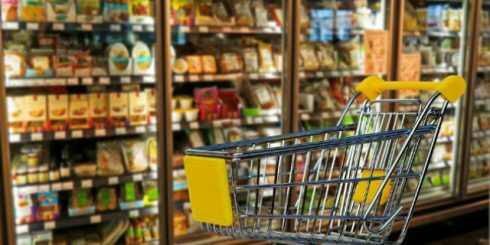 Today, more than 10 000 chemicals are allowed to be added to food and food contact materials in the United States, either directly or indirectly, under the 1958 Food Additives Amendment to the 1938 Federal Food, Drug, and Cosmetic Act (FFDCA) (public law number 85-929). Many of these were grandfathered in for use by the federal government before the 1958 amendment, and an estimated 1000 chemicals are used under a “generally recognized as safe” (GRAS) designation process without US Food and Drug Administration (FDA) approval.1 Yet, suggested in accumulating evidence from nonhuman laboratory and human epidemiological studies is that chemicals used in food and food contact materials may contribute to disease and disability. 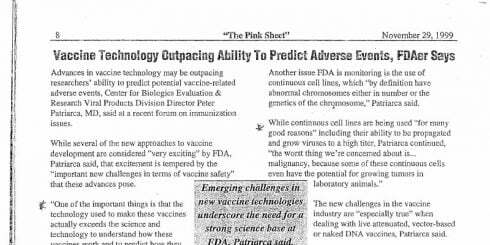 This memo and subsequent guidance spelled out the critical need to conduct preclinical studies in animal models to assess reproductive and developmental toxicity “prior to licensure of vaccines intended for maternal immunization and/or women of childbearing age”. However, the documents admitted that “lack of adverse effects on embryo/fetal development in an animal study does not necessarily imply absence of risk for humans.” Moreover, given the FDA’s emphasis that all of the recommendations included in its guidance are non-binding, the extent to which vaccine manufacturers choose to abide by them is largely unknown. 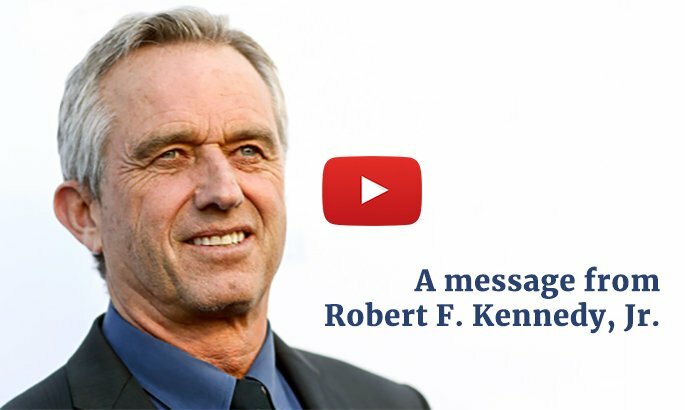 On March 30th of this year, Robert F. Kennedy, Jr., and the Children’s Health Defense team met with the Director of the FDA’s Center for Biologics Evaluation and Research (CBER) Dr. Peter Marks, M.D., Ph.D. and his colleagues to discuss the agency’s ongoing refusal to ban thimerosal, a mercury-based preservative, from vaccines in the United States. CBER is the division of the FDA responsible for approving and monitoring the safety of all biological products, including vaccines, allergenic products, blood and blood products, and cellular, tissue, and gene therapies. It seems ludicrous for one arm of the FDA, the Center for Drug Evaluation and Research (CDER), which regulates over-the-counter products to find that thimerosal and other mercury products are not generally recognized as safe and effective (GRASE) while CBER allows their widespread use in over 120 vaccines and other prescription products. 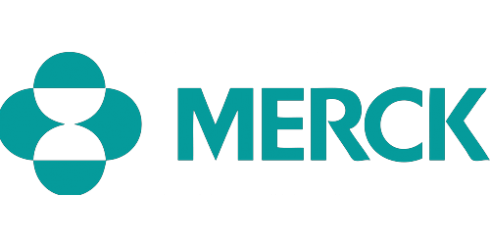 In 1998, FDA issued final rules banning thimerosal and mercury product use in over-the-counter products. Our goal at Children’s Health Defense is to extend that ban to all use of mercury in medical products both in the United States and worldwide. Advances in vaccine technology may be outpacing researchers’ ability to predict potential vaccine-related adverse events, Center for Biologics Evaluation & Research Viral Products Division Director Peter Patriarca, MD, said at a recent forum on immunization issues. 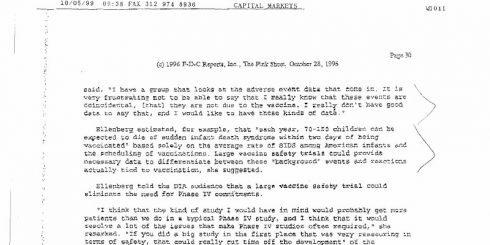 Peter Patriarca, an FDA employee, admitted back in 1999, in a confidential e-mail obtained through FOIA, that, “… the greatest point of vulnerability on this issue is that the systematic review of thimerosal in vaccines by the FDA could have been done years ago and on an ongoing basis as the childhood immunization schedule became more complex. The calculations done by FDA are not complex. 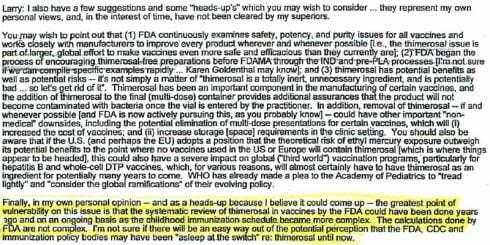 I’m not sure if there will be an easy way out of the potential perception that the FDA, CDC and immunization policy bodies may have been “asleep at the switch” re: thimerosal until now”.